A high school in Richmond, CA will be the site of a new "Fab Lab" as part of a Chevron-funded initiative to bring the maker movement into the communities where the energy company has operations. John F. Kennedy High School in the West Contra Costa Unified School District is the second digital fabrication laboratory to open in the state under a grant program run by the Fab Foundation, supported with a $10 million grant from Chevron Corp. The Fab Foundation is an extension of MIT Center for Bits & Atoms research into digital fabrication and computation. This will be the fourth fab lab of 10 the foundation expects to launch over a three-year period. The initiative was kicked off last year when the first one was opened at California State University Bakersfield in the School of Natural Science, Mathematics and Engineering. Since then, said Blair Blackwell, manager of corporate education programs at Chevron, between 1,000 and 1,500 students and community members have come through the lab. More recently an existing fab lab in Washington, D.C., Fab Lab DC, was given a makeover and expansion. Carnegie Science Center in Pittsburgh will be opening the next fab lab on August 18. That one will also feature a mobile fab lab, which will travel to schools in the region beginning this fall. All of the environments feature digital fabrication tools, computers loaded with design software, and prototyping machines such as laser cutters, 3D printers and milling machines, among other gear. At each of the centers experts are on hand to help students and members of the public learn how to use the equipment to create "almost anything" and explore the engineering design process. Blair said Chevron's involvement is tied to its requirements as an engineering company. "We need a technically qualified and diverse workforce," she explained. 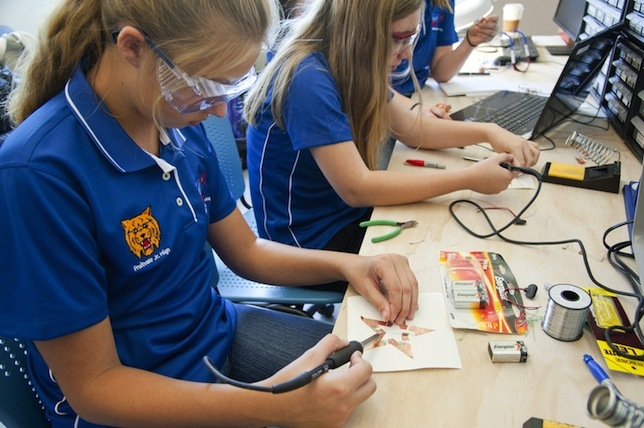 "We have a strategy that's focused on ensuring that students have opportunities to practice and get hands-on with the engineering design process and to support engineering education. Fab labs offer the opportunity for a student to take what they've learned in a classroom and connect it to the real world and then also connect it to future potential careers." Although some Chevron engineers are already involved as mentors at the Cal State Bakersfield location, she said she expected that mentoring by staff would grow as the fab labs take off. "We have lots of engineers and others who are keen to give back and to help support that next generation of innovators." The fab lab in Richmond has taken over the site of a dismantled auto shop at the high school. The $600,000 project will serve the K-12 school community in school programs and an expanded crowd in after-school, evening and weekend classes. "The development of FabLab Richmond will create completely new and unprecedented opportunities for our students, teachers and broader community, and it is an honor to have been selected as a fab lab site," said school representatives at a board meeting. Kennedy's program will be supported by the grant money for three years. Once that time is up, the high school is expected to fund staff and materials itself, at the cost of about $200,000, which, the school reported, is "a reasonable cost that will not adversely affect overall budgets."